Take a dip and admire the skyline, emerald mountains, and ocean. Grab a drink to compliment your rooftop lounging session. The resort is filled with several classy places to hangout. Gorgeous hardwood floors and finishings make for an upscale residence. Admire the ocean from atop the swanky rooftop pool. 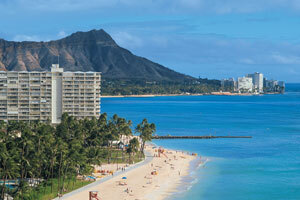 The Hokulani Waikiki By Hilton Grand Vacations is one of Waikiki’s most luxurious resorts. Ideally located in the heart of Waikiki, you’re right next door to a mall with dozens of shops, restaurants, and entertainment. Luckily, the resort has been specially soundproofed in a way that once inside makes you feel miles away from the crowds. The main attraction at the resort is the rooftop plunge pool and hot tub. Lounge poolside and admire the vast ocean views while you enjoy a refreshing cocktail from the poolside bar. If you really want to get fancy, rent a poolside cabana and relax with the family. When it’s time for lunch, dine at Cafe Mana Mona, the on-site Japanese-style cafe. It serves salads, onigiri, bento boxes, sandwiches, and desserts. Before heading back to your condo, check out the fitness center. It has everything that you need to get your cardio on. Air-conditioned one-bedroom condos sleep four guests and have kitchenettes with mini fridge and a microwave, perfect for making the basics or heating up leftovers. Your condo has no shortage of in-suite entertainment. Flat screen TVs have premium cable, including HBO, CNN, and ESPN. Catch the big game, watch a movie or your favorite show. But wait, there’s more! Challenge the kids to a game on the in-suite PlayStation 3. The PlayStation also plays Blu-Rays and DVDs. Check out the selection of rentals available from the resort, or bring favorites from home for family movie night. Once the kids have drifted off to sleep, enjoy a relaxing soak in your in-suite deep soaking tub. If you want to be in a condo on a higher floor, upgrade to a premium condo. If you’re in the mood for some retail therapy, you couldn’t have chosen a better resort. Hokulani Waikiki is just next door to the Waikiki Beach Walk Mall. Get a new swimsuit at Sunshine Swimwear; it features almost fifty brands of swimwear. Island Sole has flip flops from brands like Sanuk, Toms, Hurley, and Soles. For apparel with the “spirit of Aloha,” check out Hi Life or visit Blue Ginger for resort wear in original designs. Restaurants include Cheeseburger Beachwalk and Ruth’s Chris Steakhouse. For high-end shopping, there’s Luxury Row, just across the street from the resort. Brands at Luxury Row include Coach, Tiffany & Co., Chanel, Moncler, Saint Laurent, Miu Miu, Bottega Veneta, and Gucci. For even more retail therapy, visit Ala Moana Shopping Center. If you like department stores, you’re in luck. There’s Macy's, Bloomingdales, and Neiman Marcus. American Eagle and Express have apparel. Get a new pair of shades at Sunglass Hut. Kids will love the Disney Store. Before heading back to the resort, play a game at Lucky Strike Bowling.